NOAA Reports 3rd COLDEST October since 1895! 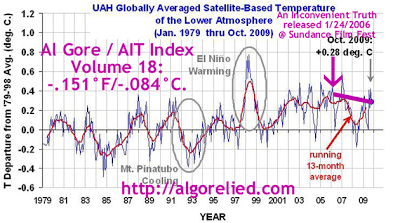 2009 – 3rd coldest October since 1895! 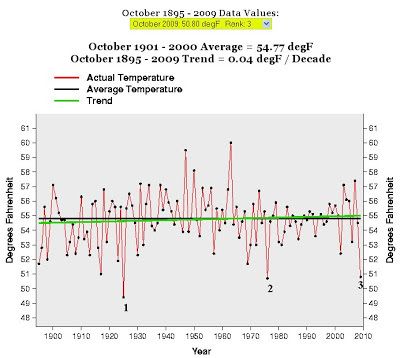 2009 – October was 4F COLDER than the 1901-2000 average! 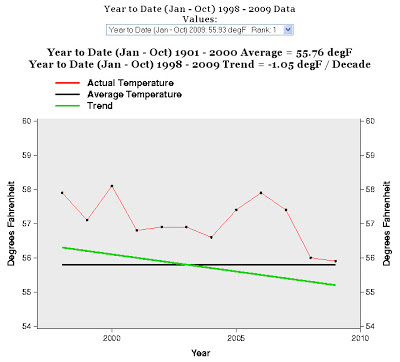 YTD 2009 – ONLY 0.17F warmer than the 1901-2000 average! YTD 1998 to 2009 – A cooling trend of -1.05F per decade! Highlighting and numerical annotation (1,2,3) are mine. Click here to reproduce the above graphs. Click here to further examine the current cooling trend. Click here for basic climate change science.